The moment when China’s first lady Peng Liyuan made her diplomatic debut upon her arrival at Moscow on Friday – wearing a dark navy overcoat, a light turquoise silk scarf with a matching handbag – the Chinese fashion industry got a boost. 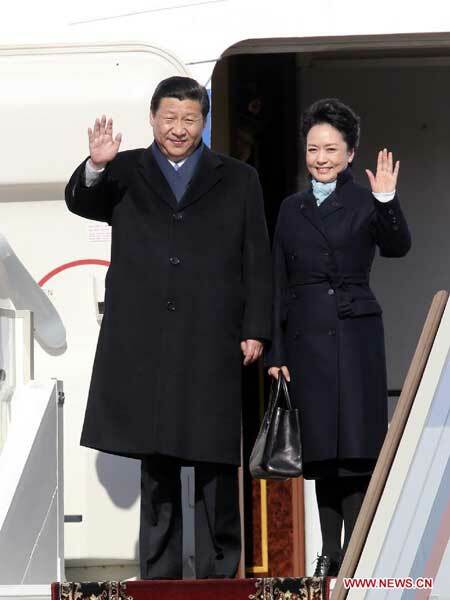 Images of Peng stepping off a plane arm-in-arm with her husband, President Xi Jinping, have circulated widely on the Internet, prompting praise for her style, which Web users described as understated and sophisticated. It’s not clear which company or companies designed the clothes worn by Peng in Moscow. While a report in China Business News said Peng was wearing a jacket and purse made by Exception de Mixmind – a top-end Guangzhou-based brand – another report on news portal Sohu.com said the Guangzhou Administration of Quality and Technology Supervision confirmed that Peng’s clothes were custom-made by Ma Ke, the chief designer for the Wu Yong brand. Both brands have declined to comment. However, regardless of the brand, Peng’s endorsement of Chinese labels has surprised millions of Chinese who favor foreign fashion brands. 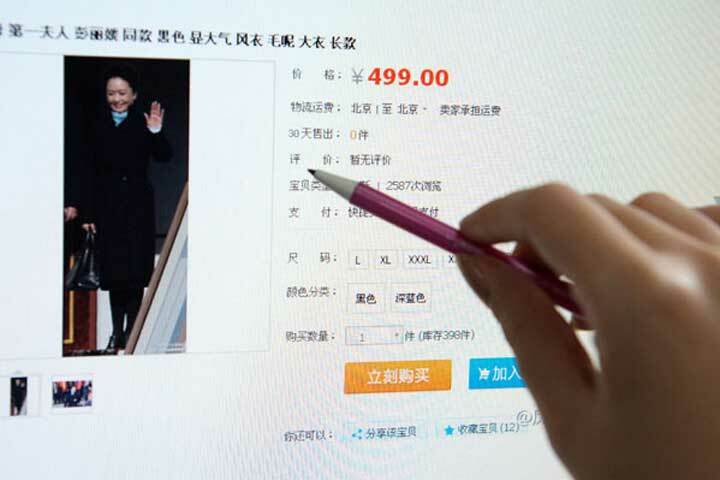 The first lady’s style was dubbed by netizens as Liyuan style. The exact purse and coat she donned have become top search items on Taobao.com, a major shopping website. Also, Exception’s physical stores have seen a rising number of visitors. Domestic fashion brands’ stock prices were also boosted on Monday by the first lady’s choice. Shares of Dayang Trands, which has made suits for many State leaders, rose about 10 percent on Monday, while shares of high-end fashion brand Kaiser China Holding Co Ltd increased 3.04 percent and Lancy Group was up 10 percent. Local designers and fashion brands always get a boost when the wives of State leaders choose domestic brands for important occasions. US first lady Michelle Obama wore a custom-made Jason Wu gown for her two inaugural balls, bringing sudden fame to the 26-year-old designer. Obama’s colorful selections – ranging from J. Crew to Jason Wu – have boosted the American fashion industry, said fashion critic Jiang Xingyi. She said the new generation of Chinese leaders has developed a taste in fashion with preference for no-logo designs rather than logo-intensive choices, boosting the domestic haute couture businesses. Jiang said that Exception and Wu Yong are being singled out because of their use of Chinese culture and ethnic elements in their designs, based on the philosophy of simplicity. "To pick up a design by a Chinese fashion brand as her debut outfit has shown her great vision and recognition of the innovations of the industry and revealed her low-profile style," Jiang saidZhi Yong, spokesman for Dayang Trands, which is listed on the Shanghai Stock Exchange, said its domestic business has been propelled by the recognition from Chinese leaders and government officials. A major exporter and manufacturer for international leading brands, Dayang Trands sees great potential in the domestic apparel market, Zhi said. The Chinese apparel industry saw declining growth in retail revenue in the first 11 months of 2012, down 6 percentage points year-on-year. Zhu Qingye, a researcher with CIConsulting who is based in Shenzhen, said domestic brands have difficulty in getting recognition. But international fashion brands are believed by Chinese consumers to be of better quality and to have stronger fashion values, he said. According to a 2013 consumer loyalty study in China made by Epsilon, consumers no longer blindly worship foreign brands, despite the fact that more than six out of 10 respondents endorse foreign brands. The study found that local-brand supporters have grown to 43 percent from 31 percent in 2011.